TPC Overall Rank: #300 out of 2933 rides. Decent theming. Great view on first hill, at least from the front car. Also a good lengthy ride. Minuses are total employee apathy and a pretty rough ride. Worth going on once. Looks better than it feels. Quite an average rollercoaster in an extra ordinary setting. And very expensive to ride. 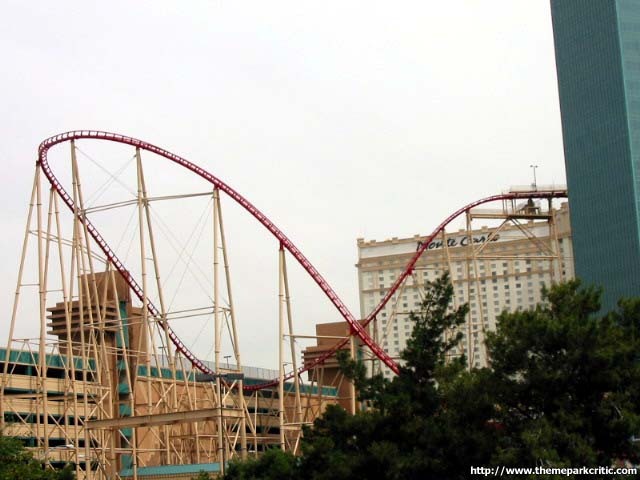 Manhattan Express, or now &quot...The Roller Coaster&quot... is a big Togo looper. It looks really cool from the strip with the occasional train zooming down the drops acompanied by screams. The ride station is located at the back of the casino and up a floor. Typically the big ride is located at the back of a park so visitors must travel past concessions and the like. Here potential riders must walk by slots, gaming tables, and other things to get your money. The trains looked really cool, not as cool as the cars on GAdv&#39...s old Viper coaster though. However, ME doesn&#39...t use Togo trains anymore. they were replaced by Primiers. The ride starts with a brake block into a large, steep lift hill. As you head up, you can see the train reflected off the windows of the towers. The lift tops out at a very deceptive 203 feet. The first drop wasn&#39...t terribly steep and levels out well above the ground. After a straight-away the train shoots up another hill and down a 144 foot drop. The train goes up another hill, turns a bit at the top, and drops onto the roof of New York, New York. Next is a vertical loop followed by a twist dive element. an awesome element if I say so myself with its couple seconds of upsidedown time. After the inversions is a brake block and a few bunny hops and some turns. The final element is a helix was actually pretty forceful and smooth. 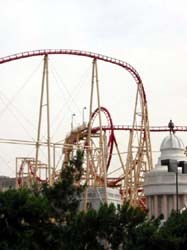 The coaster hits the brakes soon after and ends with a steep curving tunnel back to the station. The tunnel is decked out with tire drives so riders don&#39...t get the thrill of zooming down the tunnel! ME was pretty rough, but not awful. I can&#39...t imagine what the ride was like back when they had the original Togo trains though. Nice location, nice themeing, nice drops, and a couple nice elements. If you care to spent the $14 on something other than slots or poker, than this is a pretty good choice. I quite liked this roller coaster. The main reason was probably because of the views it gave. Yes, it was rough at some points, but I expected it to be. Quite rough for a steel coaster, but still alright. 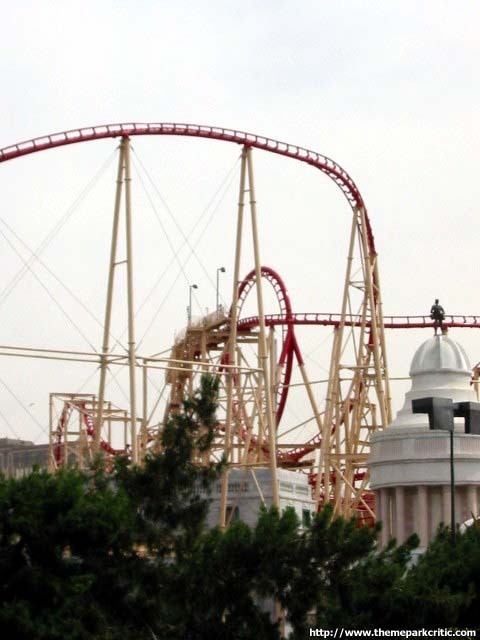 Its seen smoothe days, but its still probably the best coaster in Vegas. The theming around the ride with the mini-manhattan buildings really adds to it I think. There is basically no wait, whether morning, noon, or night, so whether you like the front or back you should be cool. A solid first drop, some decent speed and inversions make it a good overall ride experience, dont miss it if your in town. The roughness wasnt terrible, but it needs some refurbishment to smooth out the wear and tear from all its years of use. I havent been on a coaster since 1985- and this was the first modern roller coaster Ive ever ridden. Suffice to say, my eyes were closed, head was down, and I road in fear after the first inversion. Never have been scared on a coaster before. I was glad when it ended- but now I want to go again with eyes open. Didnt seem that jerky to me (but I was in crash position)- nor did I feel myself getting any serious Gs or airtime. Just high, fast, and scary. Wow. Much too pricey at $12.50, and you have to pay another 50 cents for a locker to stow your bags or camera. 2 for 1 coupons are apparently around. Our cars were delayed before the first hill because they detected a camera in front of us (? using video monitors). I did not find this ride as painful as lame. Yes, there is some jolting around, but its not as bad as, say, a Zamperla Flyer or Togo Standup. The ride is almost funny in that even during the strait sections, the ride is found bouncing between rails. The loop and heartline were ok but still nothing to make me like the ride. The part after the heartline is simpyl humerous - the bunny hops are stupid, the helix things are rough and overall the ride is lackluster. Not terribl, but still pretty bad. Imagine sitting in a shopping cart as it is pushed down a flight of stairs.. thats about what Manhattan Express is worth. The first thing I noticed about this ride is the strange restraint. Its like a pitchfork over your shoulders. The problem with it is that instead of raising out of your seat for the bunny hops, you just press into the arms over your shoulders which is a little uncomfortable and it also takes away one of peoples favorite part of coasters, airtime. Other than that, it is a solid ride. A good mini drop off of the lift into a large drop into the main portion of the ride. The feature move of the ride is the heartline roll and dive. With so many coasters being built every year it is tough to be unique, and this element definately is unique. It just seemed a little better to me than your typical B&M zero-G roll. A good ride, but not quite great. If you got the money, definately give it a try.